Lady Superior by Alex Ziebart just hit the digital shelves and I had the good fortune to get my grubby paws on a beta copy. What follows is my review, impressions, and some chat about the book. I’ll avoid spoilers, of course, but if you want to skip through, I have a TLDR at the end. First, let’s talk about the experience of reading Lady Superior. I’m a busy father of two, with a full-time job, a couple side gigs, and projects of my own — not a lot of free time on my hands, is what I’m saying. But once I dug into the book, I finished it in less than 24 hours. I couldn’t tell you how long it took to read consecutively; I meant to time it for the sake of science, but I got so lost in the narrative that I kind of forgot. Lady Superior reads like a time capsule of superhero fun. Before superheroes started strapping on pouches and angst, superheroes delivered thrills, inspiration, and a rioting good time. 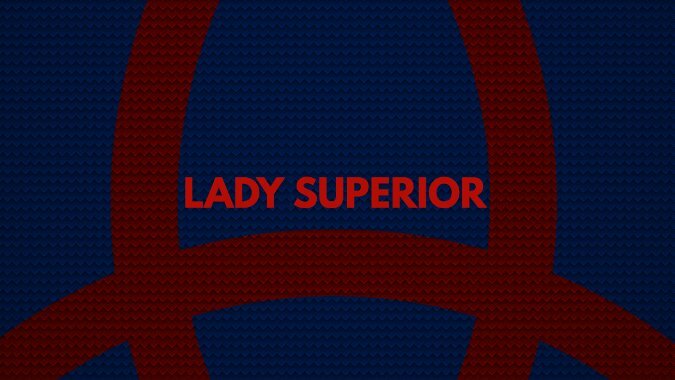 That’s what Lady Superior delivers and it’s one hell of a breath of fresh air. The whole book is like that favorite episode of The Flash; that one you put on Netflix for background noise while you clean the kitchen, only to find yourself planted on the couch 30 minutes later, sucked into the fun. So, let’s talk a little more about the book itself. Not quite an origin story, Lady Superior marks the beginning of the titular hero’s career. Kris embarks as the world’s first public superhero, not only on behalf of herself, but for the ambiguous number of other superhumans out there in the world. She’s not alone, either; a mentor-slash-archaeologist by way of Lara Croft is out there helping Kris find her way. Ziebart manages to stay true to the four-color world of the comics while drawing from history’s favorite legends and a hefty dose of occult lore. Rather than seeming implausible, the genre mashup feel reminiscent of Doctor Strange or John Constantine. But there’s no secret mystic master on Kris’s side; this superwoman must tackle mysterious supernatural creatures on her own. Lady Superior struggles a bit with its number of plot points and characters, but that’s common with first books in a series. In the same way the first Dresden book had to tackle world-building, character development, and still deliver a story arc, Lady Superior shoulders the same burden while trying to create a hybrid universe. I’d argue that Ziebart’s book handled the job a little more smoothly, mostly by maintaining its dedication to the story itself. Rather than getting lost in masturbatory philosophy about the nature of magic or Kris’s inner nerd, Lady Superior keeps every paragraph focused on what’s happening in the story. Ziebart doesn’t waste a lot of time hypothesizing about the source of superhuman powers; a few lines talk about the explosion of new talents in the world, and then Kris shoots off to chase the bad guy. Kris doesn’t have time to navel-gaze so Ziebart doesn’t shave any yaks in his prose. Of course, that dynamic is part of what makes Lady Superior such a fast and furious ride. TLDR: Lady Superior by Alex Ziebart is a superhero occult novel that’s super fun to read. It doesn’t waste any words on anything but story and that story gets started right away. It’s totally worth your time and money. Note hat Alex Ziebart is an editor at Blizzard Watch. I was not influenced or paid for this post.